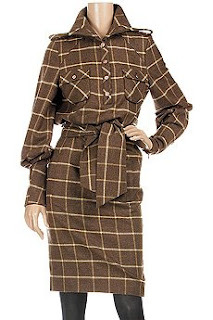 Fall 2008 embraces the vintage look and all it's ladylike trappings. Luxurious fabrics, faux fur edgings and trim offer an elegant look for late-night parties. Traditional, tailored clothing are classic and timeless, which are always ideal choices for the workplace environment. Search for patterns that look best on you. Select from the classic pinstripes, jacquards, checks, paisleys, and tweed. Faux animal prints have made a comebcack this season, with leopard being the most popular. For those who are not so daring, accessories such as belts, handbags, and shoes can add the animal or reptile look without being overstated. Look for alligator, crocodile, or snakeskin to complete your ensemble.